Not many people know that the prototype for William Lawrence Stephenson's fabulous yacht Velsheda was his K-class called “White Heather II” (sail number K7), designed by William Fife and built in 1907. To this day, more than a hundred years later, Velsheda (sail number J-K7) still has the lead from White Heather II in her keel. In her heyday in the 1930s Velsheda only sailed for just 3 seasons. She then spent almost 50 years stuck in the mud, and quietly rotting, until her astonishing rescue in the early 1980s by Terry Brabant (a scrap dealer with extraordinary vision). At the time not a single J-class yacht remained in seaworthy order and the class faced extinction. Terry rebuilt Velsheda virtually from a bare hull, plus a pile of salvage from other vessels. Of course he also had to have a few things custom made such as her gigantic sails and unique mast. Eventually he had a yacht in a class of her own and was free to do with her as he pleased. In this, her second incarnation, Velsheda led a surprisingly adventurous and often chaotic existence. 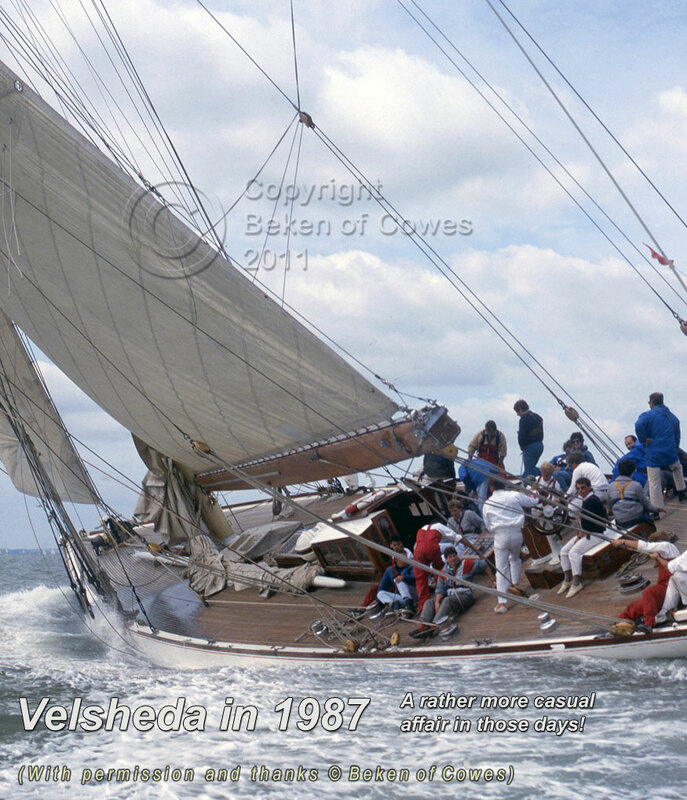 I've written a more detailed article (first published in the March 2011 issue of St. Andrews in Focus, which you can read here, or alternatively here) about the early history of Velsheda, how she came to be built together with some biographical insight into her first owner. By the 1990s Velsheda was once again nothing but a neglected metal hull together with a few miss-fitting odds and ends. It was in this state (after changing hands at least once) she was finally purchased by Ronald De Waal who proceeded to spend literally millions turning her into what she is today; an amazing third incarnation of the original yacht, but now in all her 21st century glory. Her first incarnation (during the 1930s) is of course the stuff of legend and folk-lore, but it's as she now is in her dramatically different 3rd incarnation that she's best known and loved. [I nickname her “The Immortal Velsheda” partly because of all these various incarnations]. 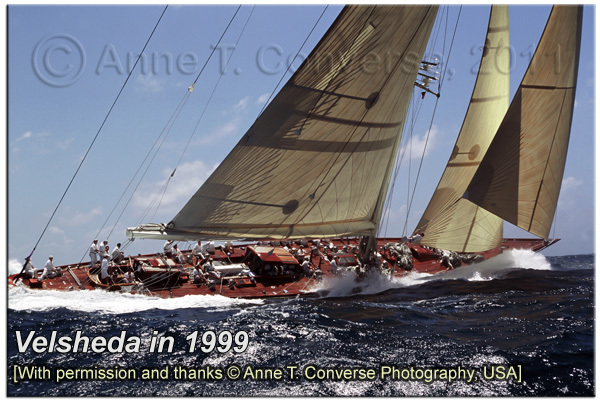 My personal Velsheda story relates to her mysterious 2nd incarnation; a virtually undocumented and unknown period of her history; a time when almost anything could (and sometimes nearly did) happen…..
Due to an odd series of circumstances I came to be casually hired as a deckhand, joining a very short-handed delivery crew to sail Velsheda from Sardinia to France. Although I’d quite often been sailing at various times since my school days I most certainly wasn’t a yachtsman, and wasn’t even especially tough or fit, so it was all the more surprising that I found myself on board. Things soon took a turn for the worse; we became trapped at sea for several days in unexpectedly heavy weather; a mistral storm. It was an exhilarating but appallingly dangerous place to be; there were near misses all the time and literally every hour or two some dreadful accident or other nearly (but very luckily never quite) happened. Probably the worst and most dramatic moment for me was being washed off the side of the foredeck and ending up hanging, completely unprotected, from the corner of the jib as I was briefly dragged along through waves until I managed to scramble back on board. Shockingly nobody even seemed to notice - they were all busy fighting their own personal battles; we were desperately holding our course and simply trying to stay afloat and in one piece until the wind dropped, which it eventually did almost four days later. If I hadn’t hung on to that sail till miraculously being hauled back as the rigging was adjusted (after we completed the tack), it’s quite possible I’d have been dead within 48 hours. I very much doubt they could have gone looking for me, and even if they’d tried, and by some fluke found me, I can’t imagine how they’d have been able to manoeuvre the Velsheda (under sail power alone and in a storm) in order to rescue me. I think it inconceivable that any of this could happen aboard Velsheda today, and if it did it would make international headlines. It’s the contrast between “then and now” and a glimpse into the relatively unknown history of Velsheda that I believes makes this such an intriguing and compelling story. People have always been interested in (OK, fascinated by) the J’s – they're such an endless source of inspiration, wonder and aspiration to many - which makes the fact a “nobody” like me could actually sail and experience her, and in her rawest and wildest state too, all the more remarkable. As an important footnote I’d like to once again point out our extraordinary debt to Terry Brabant. Without his adventurous and daring spirit, leading the way, I doubt that anyone would have thought of reviving J-class yachting.